Hello Kitty. In Torrance tomorrow. I once took a bite out of a Hello Kitty pencil eraser. The little white square with Sanrio’s happy feline on it just smelled so incredibly yummy I bit off a corner before I could stop myself. Tomorrow, if you head to Del Amo Fashion Square (the courtyard near AMC Theatres) you can taste actual Hello Kitty sweets. Why? Because the adorable pink Hello Kitty Café Truck will be parked there from 10 a.m.—8 p.m and they are serving, among other baked goods and coffees with charming latte art, a set of four mini-cakes that, like any good Hello Kitty item, are beyond adorable. Hello #Torrance! The #HelloKittyCafe Truck is coming to @delamofashion this Saturday 1/28 and bringing our supercute set of four hand-decorated minicakes! Find us near the AMC Theaters between 10am-8pm, while supplies last! See you soon! They will, naturally have merch on hand too for sale, but taste the cakes and cookies, not the erasers. Follow them on Facebook for the truck’s next stop or head to OC where they have a yearlong Pop-Up Container at the Irvine Spectrum Center if you find your cuteness quotient waning. Happy #NationalGourmetCoffeeDay! Enjoy a delicious mocha or latte brewed from beans sourced from local artisan roasters and served in our supercute signature pink cup! 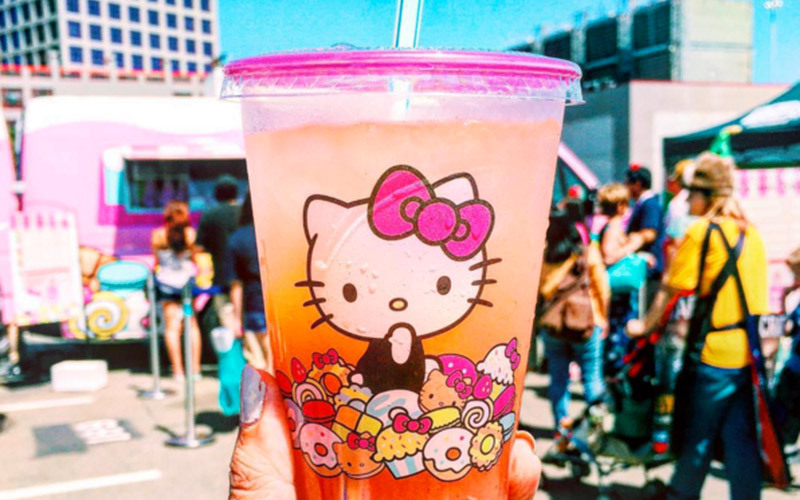 Available all day at the #HelloKittyCafe Pop-Up Container at the @irvinespectrumcenter! See you soon! Kari Mozena is the Special Projects Manager at Los Angeles magazine and LAMag.com. You can follow her on Twitter and Instagram. She wrote recently wrote: The Most Enchanting, Nostalgic Candy Stores In L.A.